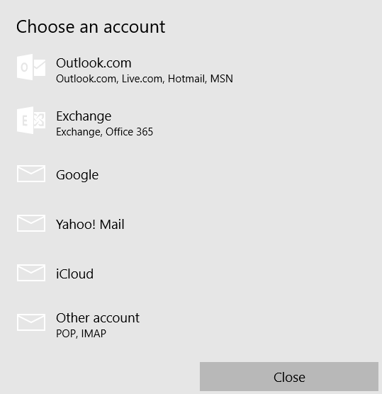 I use Windows Mail for my email, will it check Office 365 email? It will not work if you choose Outlook.com. The first time you open the Mail app, you’ll see a Welcome page. Choose Add account there to get started. Otherwise, at the bottom of the left navigation pane, choose Settings > Manage Accounts > Add account. You will want to select "Exchange"
Enter the required information and choose Sign in. For most accounts, this is your email address and password. If you receive the message “We couldn’t find info for that account. Make sure that the email address is correct and then try again,” you’ll need to choose Try again three times before the button changes to Advanced. Choose Done. Your data will start syncing as soon as your account is set up. Note: It may take a few minutes for your account to synchronize. During this time, you may see Not synced yet in the message pane. If this message persists, see Resolve sync issues in Mail and Calendar apps in Windows 10. If you're having problems setting up your account, try the following. Make sure your email address and password are correct. Passwords are case-sensitive. If you see your most recent messages but no older messages, you probably need to change your email sync duration. If you see a message that your account is out-of-date, you probably need to either update your password, your incoming or outgoing servers, or your SSL settings. See Fixing an out-of-date account for more information. If you want to remove an account, see Delete an email account from Mail and Calendar apps.